Here in our (digital) office, we’ve been enjoying spring music for months, while our most astute readers have been discovering the buds on our News page. Now it’s time to reveal the new crop. Over 240 albums will be introduced on these pages over the next five days, all lovingly hyperlinked for your listening pleasure. Many more will be announced as spring continues ~ this is only a taste of what is to come! The calendar tells us that the snow will melt soon; we’re as excited about the spring slate as we are about the return to short sleeves. We hope that you will enjoy meeting these releases as much as we have. Our cover image is taken from Lullatone’s Thinking About Thursdays, the 2016 track-a-week project that became an album in 2017 and is still making waves. 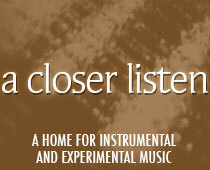 Be sure to check out the duo’s recent release of piano reworks, music for museum gift shops. And now, without further ado, we present the season’s slate of ambient and drone! Six CDs or nine LPs, currently listed for $88 or $236: vinyl lovers are facing a huge financial decision. (Amazon initially listed the set for $36, so those who saw it got a real bargain!) But one thing that’s not in question is the magnitude of this release, which includes 30 years of new, rare and unreleased tracks and a 64-page book. The latest installations were created just last year in Bari (Italy) and Kazakhstan. The presentation is lovely, as seen below. What are you waiting for? Arovane & Porya Hatami will be releasing two albums this spring, one old and one new. First out the gate is Organism_evolution, a sequel of sorts to last year’s Organism. A special edition double disc will also be available containing both releases (Karlrecords, 20 April). This will be followed two weeks later by the reissue of KAZIWA on gold and black splatter vinyl from n5MD, along with an extremely limited edition from Time Released Sound, including gold thread and x-ray packaging (4 May). Come for the look, stay for the sound! Whitelabrecs is upping the production count for an upcoming album by Paper Relics, who first made a name for themselves on Time Released Sound as well. The duo is comprised of Spheruleus and his brother Stuart. While there’s a lot of ambience in the set, The Road Home also incorporates a good deal of post-rock (24 March). Landing between these genres we also find Walrus Ghost & Max Frankl, whose Avenues and Remembrances splashes at the quieter end of the post-rock pool (Hush Hush, 13 April); and aidan, whose catharsis shimmers like the last waking thought of the day (31 March). Okada continues to paint across genres with Misery, an album whose sound is anything but. His compositions twist and turn like modern composition, while their electronic aspects meld well with the soothing ambience. The artist classifies this music as melancholy; we prefer to call it empathy (n5MD, 6 April). 7FO draws from the classic ambient electronic sound on Moment (Selected Works 2012-2017); even the video is retro. The album can be classified as warm, synthetic and soothing (Métron Records, 13 April). bvdub has two albums slated for spring: one here and one in our Electronic section under a different name. A Different Definition of Love is exactly what we’ve come to expect from his ambient side, as clouds of sound attach and detach like kind lovers (Dronarivm, 30 March). Following in the footsteps of these artists is Adamo Golán, whose debut album The Exile and the New offers a kind blend of field recordings, electronics and ambience (Kingdoms, 27 April). Obelisk is the latest effort from Hakobune, including three extended tracks of undulating guitar tones. While listening, one can imagine the music wafting through the cover curtains (Polar Seas, 6 April). And mayforest returns with „roots“, exploring connections with nature, place and time through field recordings, piano and slowly unfurling ambience (27 April). One of the few vocal acts we’ve covered is Birds of Passage; Alicia Merz’s voice is difficult to resist. The Death of Our Invention continues to mesmerize, and is out 6 April on Denovali. Of similar appeal is the elegiac Liz Harris, otherwise known as Grouper. Her latest album of piano and sheltered voice is called Grid of Points, and is out 28 April on Kranky. Also on Kranky we find Christina Vantzou, who recently released an album under her easy-to-guise CV guise. Her new solo effort no.4 will see the light of day on 6 April. Tourist Kid folds in a number of influences on Crude Tracer (Memory as Truth, 11 May). Vocal snippets, digital discharges and periods of piano all have their place here. And perhaps the most calming album of the season is Hundreds of Days, from harpist Mary Lattimore; even the cover art is soothing. Just play Hello from the Edge of the Earth and feel the troubles of the day slip away (Ghostly International, 18 May). Colin Fisher‘s V La Pape is more active than the typical ambient release. On the surface, it’s a collection of improvised guitar and loop pedal, but beneath that lies a shamanistic base. The artist’s fascination with the Tarot is demonstrated through the cover card (Geej, 23 March). In the devotional field is also the Hindi-esque Pastimes of Creation, a meditative set from Mukunda’s Friends (Kalindi Music, 24 March). Accordion is the main instrument, but the selling point for many will be the connection to former folk favorites the Cowboy Junkies. Lying right on that porous ambient/drone border is Field Harmonics‘ elegant Corpsing, an album much lovelier than its title would indicate (30 March); Wayside & Woodland will follow this release with the trio of A Sentence‘s Component #4 (April), E.L. Heath‘s Smiling Leaf (May) and My Autumn Empire‘s Oh, Leaking Universe (June). We had a hard time deciding whether to categorize Sonae‘s music as ambient or electronic ~ after all, it does have dance beats. However, they tend to appear and disappear quickly, as heard in the title track below. Sonae calls I Started Wearing Black an exercise in hauntology, and this set ranges from subtle to unsettling. We loved her last record, so we’re looking forward to deciphering the codes of her new one (Monika Enterprise, 13 April). Shall Remain Nameless offers a new set with a classic dark ambient vibe, replete with dub flavors, crackles and a cuckoo clock. All it needs is a better title; Untitled is out 6 April. Skin Crime backs off a bit from the noise, but remains just as intimidating on Ghosts Have Been, an atmospheric offering on Hospital Productions (23 March). Dronny Darko completes his “dark trilogy” with the release of the moody and melancholic Black Hive, preceded by the dripping “Lurkers” and droning “Luminous” (Cryo Chamber, 20 March). And Cyclic Law celebrates its 100th release this April with the shamanistic Monad, from Visions and Phurpa, first announced last fall but finally seeing the light of day (dark of night?). Other upcoming albums on the label include a dual-tiered offering from Taphephobia: the introspectively drifing Ghostwood and a collaboration with Kave, Monuments, as well as the drone industrial of Dødsmaskin‘s Ingenting (all released 10 April) and Nordvargr‘s guttural, grinding Metempsychosis (31 March). Happy 100th, Cyclic Law! We’ve been eagerly waiting to hear new music from this Australian artist, and she goes all-out on her new multi-media release. The music delves into sonic extremes, rising from void to cacophony, while the book explores reactions and interpretations, offering more questions than answers. While the album is called Love Songs, the theme is unhealthy love, from abuse to mental illness. The listening experience may not be romantic, but it might be healing. It’s a bittersweet treat to hear new music from Matt Shoemaker, who passed away all too young. The Helen Scarsdale Agency will be releasing two diverse tapes under the artist’s Fosil Sangiran moniker on 18 May. The first, Pasar Fosil, is what one likely expects to hear from Shoemaker: long drones that mutate from metal to sandpaper. The second, Khayal Kuno, has motorik rhythms and exudes a sense of being lost in the jungle. A memorial concert is also being planned, featuring Jim Haynes, Colin Andrew Sheffield and others, along with an installation, both in Seattle later this season. Unusual elements make Anne Guthrie‘s Brass Orchids a standout ~ take for example the tap dancing in “Spider”, something we’d never expect to hear in the genre. The album may center on glitched drone, but it also has a heart. Most appealing is the incorporation of Guthrie’s late grandfather on piano: a legacy that endures, a duet between generations and planes (Students of Decay, 23 March, pictured right). Mark Pritchard‘s The Four Worlds is low on beats and high on atmosphere. The project began as an installation and is now being translated to wax. Lead track “Come Let Us” features a spoken word loop by Gregory Whitehead and lends the Tower of Babel a spooky undercurrent. The video is even better, bringing a new angle to an old story; check it out below (Warp, 23 March). It’s been a long time since we’ve heard from Kyle Bobby Dunn, but his 20-minute contribution to the upcoming split The Searchers/Voyevoda is guaranteed to satisfy fans. Wayne Robert Thomas occupies the other side of the cream colored vinyl; together, these musicians cast a mesmerizing spell (Whited Sepulchre, 1 May). Site favorites Saåad are also back this spring with the expressive Présence Absente. The music has a church-like essence, and concludes with a lovely patch of bells (Hands in the Dark, 13 April). Rising from the ashes of Swans we find the meditative, transcendent sounds of This Is Where, a trio led by Norman Westberg that travels deep into abstraction. No lyrics here, just waves (Hallow Ground, 6 April). An unusual transformation takes place on Rex Kyed‘s self-titled EP, due 24 March on Infinite Waves. The duo was once involved in the Copenhagen punk scene, gravitated to the electronic Svartbag and is now experimenting with drone. C. Diab brings his bowed guitar technique to Exit Rumination, sparking comparisons with Richard Skelton. The album is thick and melancholic, adorned by trumpet, tape & loop (Injazero, 29 March). Out of season yet extraordinarily elegant is The Autumn Elegy, which marks the return of Wist Records. The lovingly packaged project comes from the duo Glowing Swords (Zachary Corsa of Nonconnah and Lost Trail & Scott Cortez of Loveslivescrushing) and is due 29 March. And while one would normally question the release of a snow-graced album at this time of year, select * from my heart‘s TRUNCATED contains a cold cut called “march_snowfall” and reflects the recent blizzards in Europe and the U.S. (23 March). CUTS releases the score to EXIST on two 12″s 27 April. The film has narration by Alan Moore; no word if he appears on the album (Village Green). Midira Records brings a pair of drone releases this season (as well as one jazz release, listed later). Amandus Schaap & Evert Kramer‘s “Rain in My Heart” takes us to the heart of the storm, while Matawan‘s “We Lingered in the Chambers of the Sea” sinks us to the depths of the ocean. Done and We Lingered in the Chambers of the Sea are each released on 6 April. Dinzu Artefacts has a trio of releases slated for the first day of spring, each with an experimental flair. Tap Water‘s Amnesia Nightmare turns drips into horrifying yet compelling sonic shapes, operating as a single two-part composition; Phil Maguire‘s Fower/Fowk tapes and re-tapes its original sources, muting their original impact yet creating something new; OHM‘s live G5 creates drones out of layered instruments, including some that sound like shed tools (March 20). Patient Sounds has unveiled an extensive spring slate, beginning with a three-pronged release pack on 23 March: Electric Sound Bath‘s The Forces, Daniel Klag‘s Anticipation, and the label’s landmark 1ooth release, Peter Speers‘ Indian Boundary Park. These will be followed by a six-pack of new tapes from Tiger Village and Willy Smart (April), Chris Whitley and Lake Mary & M. Sage (May) and Cody Yantis/Rene Margraff and Sacred Aviary (June). The label also sells chapbooks, as seen to the right.